Curious thing about WALL STREET: MONEY NEVER SLEEPS. The whole movie is about money. People in this movie talk about it constantly, obsess over it, worship it, and revere it. But never once in the movie do we actually see anybody handling money or using it to purchase anything except for one important scene. And I’m inclined to think that Oliver Stone excluded the actual appearance of money for a reason. Instead we see the things that money can buy. The luxurious condos and lofts. The elegant mansions. The beautiful clothes and stylish cars. The exclusive restaurants you can eat in and the clubs you can party at. And we see the effect the pursuit of money has on people as well. But as Gordon Gekko (Michael Douglas) himself says, money even isn’t the point. It’s playing the game. The game is all there is and the more money one has is just the way the game players tell who’s winning and who’s losing. And who should know better than him? The character of Gordon Gekko became the symbol for Wall Street in the 80’s and 90’s. Michael Douglas has said in interviews that for years after he made that movie, young stockbrokers would come up to him and tell him they got into the game because of his performance. The movie picks up on one time corporate raider Gordon Gekko after he’s done time in jail following the events of “Wall Street”. Upon his release he writes a successful best-selling book and goes on the lecture circuit. It’s at a book signing he’s approached by Jake Moore (Shia LeBeouf) a hungry and ambitious young trader who also happens to be engaged to Gekko’s daughter Winnie (Carey Mulligan). 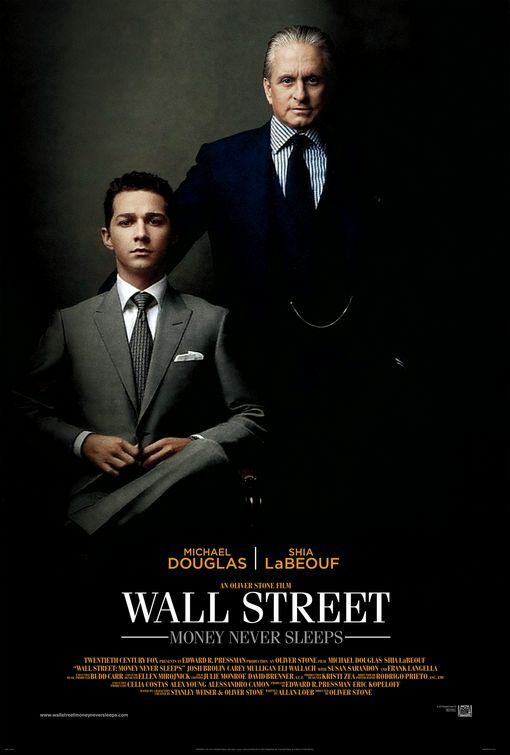 Jake wants Gekko’s help to get revenge on Bretton James (Josh Brolin) CEO of a major investment bank. James engineered the collapse of the investment firm Jake worked on. The collapse of the firm and the humiliation of the way it was done caused the managing director and Jake’s mentor Lew Zabel (Frank Langella) to take his own life. Gekko’s willing to help, working behind the scenes to gather information and advising Jake on the best way to use it to get back at James. But in return, Gekko wants Jake’s help so that he can reconcile with Winnie who wants absolutely nothing to do with her father. Jake is walking a fine line here as Winnie tells him plainly that her father is not to be trusted and he’s only using Jake for some reason. But Jake is undeniably attracted to Gekko’s uncanny business insight and knowledge and is eager to know what Gekko knows. It’s an unenviable position to be in. Especially when Jake learns first-hand that James is as manipulative and cruel as Gekko himself. WALL STREET: MONEY NEVER SLEEPS is one of those movies where I didn’t understand a blessed thing the characters were saying when it comes to stocks and trading and securities and anything having to do with that world. But on the other hand I felt smarter listening to them talk. And it’s to the credit of the screenwriters that they break it down so that you can follow who’s doing what to whom and who’s manipulating what and why without making the characters sound as if they were dumb. Michael Douglas is clearly having a ball playing Gordon Gekko. He’s all smiles and charm with a ‘Hail and well met, good fellow!’ type of cheerfulness. I didn’t get the impression he was trying to top his legendary performance in “Wall Street” but instead simply slipped back on Gordon Gekko’s skin and walked around in it. It’s an effortless performance that provides the movie with a lot of the best lines and best scenes. I’m still not sure how I feel about Shia LeBeouf as an actor. He’s professional, sure. And he’s enjoyable to watch. But he hasn’t yet mastered the knack of disappearing into his role and letting the character do the work. Josh Brolin is always worth watching and he doesn’t disappoint here. No matter what he’s in, I’m guaranteed a good performance. Carey Mulligan holds up her end quite well but her character is a puzzle and even in the movie other characters wonder why she’s engaged to a Wall Street guy when she hates her father so much. There are also a couple of cameos in here that are worth looking for. If there’s any surprise here, it’s in Oliver Stone’s direction. He’s mellowed out as a director and the man who directed such angry movies as the original “Wall Street” “Born On The Fourth Of July” or “Salvador” isn’t directing this movie. He’s gotten more thoughtful and even-handed I think. And it shows in his solid direction. I love a director who puts the camera down, doesn’t jiggle it all over the place, puts the actors in front of the camera and lets them act. And that’s what Stone does here. But he seems to have relaxed a bit and his usual political slant isn’t in evidence here or at least I couldn’t see it. In fact, WALL STREET: MONEY NEVER SLEEPS plays out as a more-or-less conventional drama set in the financial world and isn’t the searing indictment of Wall Street and the nation’s current financial crisis I expected it to be. So should you see WALL STREET: MONEY NEVER SLEEPS? I think so. It’s entertainment that has enough of modern day relevance to provide just enough of thought to edge it out of the “it’s just a popcorn movie” tier. And it is fun to see Michael Douglas give life to his most famous movie character again. It’s not as good as the original “Wall Street” but after all these years it’s a whole lot better than it had to be and that’s something right there.